"Time changes everything except something within us which is always surprised by change". 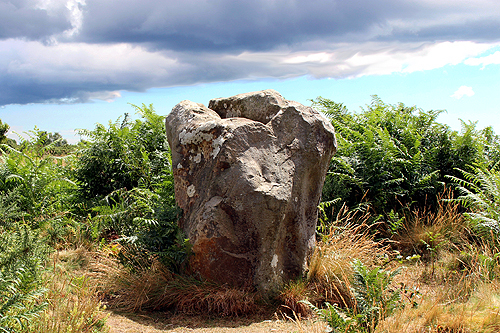 Situated to the south west of Bere Regis on black hill heath, is the Devils stone megalith. 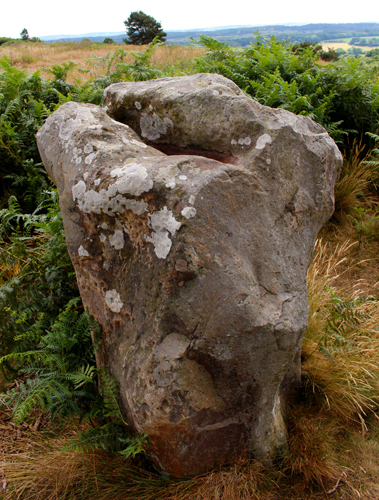 The stone is about 5 and half feet tall (168 cms) and made of a sandstone with an unusual channel in the top that catches rain and condensation. It may have been placed at one point of a ditched barrow, but it it difficult to identify the feature through the gorse. 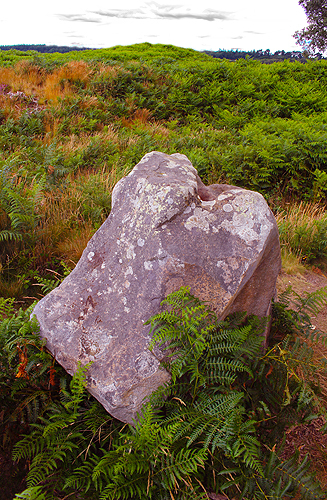 The devils stone showing the top channel. The name is local and probably relates to folk tales in which the Devil either challenges or bets he can throw a rock further than somebody else. 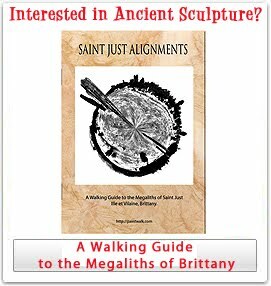 These stories often relate to upright stones because of their half buried nature. Other stones with similar names are sometimes called "hurlers" or "Hell Stones" and there are other megaliths in Dorset that keep these names. Locally it is also known as the "5 fingered stone" due to the size of a child's hand being able to fit into the hollow top and draw water from it. Bowl or bell barrows near the Stone in a south west alignment. The Bere Regis area is particularly rich in Bronze age burial mounds that have been dated to between c. 1700 B.C. and c. 1000 B.C. The Barrows covered primary burials from these dates and were often accompanied by bell beakers and long-necked beakers. The Devils Stone is placed near a line of three bronze age burial mounds so its significance would have been important between these times. 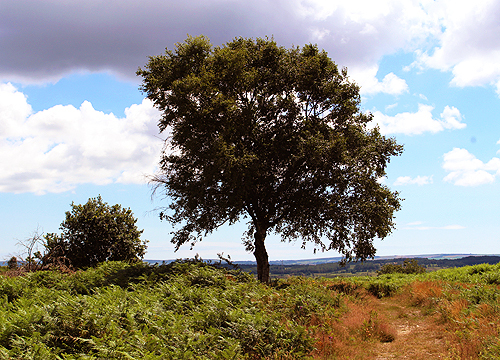 The bell and bank barrows seem carefully placed for visibility from or towards certain points. Most of the barrows appear to have been deliberately placed just off the highest point in the locality, so from a distance they will appear in silhouette only from certain directions. Inventory of the Historical Monuments in Dorset, Volume 2, 1970 relating to the Bere Regis barrows. Round barrows are predominantly the burial mounds of the Bronze Age. There is plenty of evidence to show that these round barrows were used as markers or fixed points in the laying out of later 'Celtic' field systems. In general they were deliberately preserved by the farmers of these fields and this may be a reason why there are so many left in such good condition. Nearby Woodbury Hill and Weatherby Castle attest to a large population of Iron age people continuing to live in the area. The Devils Stone can be found by taking a right from the Rye Hill road and taking a gravel road towards the caravan park. Walk past the park and just at the top of the hill on the right is a small gate that leads into the heath. If you use google maps satellite at maximum magnification you can see the stone and its hollow from above. Carry on through the quarry and you should be able to see the barrows. At the end of the quarry take the left path where this will take you towards the three barrows. When you get to them you will find the stone on the left near a footpath crossroads.